North Korea’s Military Partnerships Under Threat? The latest UN sanctions on the Democratic People’s Republic of Korea (DPRK) have locked the two Koreas in a war for influence on far-flung battlegrounds, from the Middle East to Africa to Latin America. Seoul, however, could inadvertently minimize any future gains in the fight without careful reflection on its results to date. Since UN Security Council Resolution (UNSCR) 2270 took effect in March—a response to North Korea’s fourth nuclear test and February satellite launch—South Korean President Park Geun-hye and key members of her Cabinet have devoted much of their time to tightening enforcement of the international ban on military-related trade with the DPRK. In high-profile visits to Iran, Ethiopia, Uganda and Cuba, the officials have leveraged South Korea’s checkbook to assert that a partnership with Seoul can be more lucrative than their existing military relationships with North Korea, and that strengthening the former requires halting the latter. Its effort to date, however, has proven that North Korea’s bilateral relationships are not simply for sale. South Korea’s experiences in Iran, Ethiopia, Uganda and Cuba highlight the need for Seoul to carefully calibrate its outreach to the DPRK’s partners regarding sanctions implementation, accounting for their military needs, political sensitivities and other interests. Since UNSCR 2270 clarified and expanded the existing sanctions regime against North Korea, President Park has reoriented her North Korea policy to emphasize sanctions and establish a major role for South Korea in promoting global compliance with UN resolutions. South Korea described Park’s recent visits to Iran and Uganda, and South Korean Foreign Minister Yun Byung-se’s visit to Cuba, as a “part of diplomatic efforts to enlist the international community to the effort to bring about change in North Korea on all fronts.” These countries are among Pyongyang’s longest-standing military customers; for years, they have procured arms-related goods or services from North Korea in violation of international sanctions. If these nations could be persuaded to comply with UN sanctions, their cooperation would substantially strengthen broader efforts to curb illicit North Korean revenue streams and deny safe havens to North Korean networks. A preliminary review of Park’s campaign, however, reveals mixed results. Ugandan President Yoweri Museveni pledged during Park’s visit to end his country’s sanctions-busting military cooperation with North Korea, but the public relations pressure that prompted his commitment in May suggests its implementation will require close scrutiny. The outcomes of Park’s efforts elsewhere appear less successful, suggesting that North Korea will hold much of the contested ground for the next several years. Pyongyang recognizes that positive relations with the developing world can generate not only revenue, but also international support for the DPRK’s policies ranging from calls for a peace agreement to replace the current armistice agreement, to objections to the UN’s condemnation of the North’s human rights record, to resistance and indignation to UN and unilateral sanctions. To limit the damage from Park’s campaign and preserve its few friendships, Pyongyang has deployed high-level officials to meet and sign new political and security agreements with counterparts in Africa, Southeast Asia and Latin America. 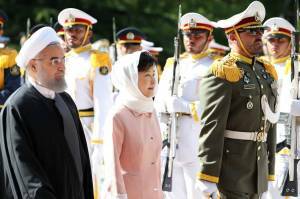 In early May, President Park made Iran the first stop of her public campaign to erode demand for North Korean arms-related goods and services. Tehran has been one of Pyongyang’s most valuable military partners and, at minimum, the two governments are believed to still be cooperating on missile development. By including over 220 business representatives in its delegation to Iran, South Korea presented the visit as a major opportunity to improve bilateral economic engagement. Park’s political rationale for proposing new economic agreements was barely veiled: she hoped to incentivize Iranian cooperation with the UN sanctions regime on North Korea, which forbids the type of military collaboration that has characterized the North Korea-Iran relationship for decades. From the media coverage surrounding the visit, it was apparent that Park had pushed Iranian President Hassan Rouhani to condemn North Korea’s recent provocations and renounce Iranian-North Korean military ties. It is unlikely, however, that she got what she was looking for; Rouhani merely commented that Iran has always been “in principle, opposed to any nuclear [weapons] development,” and that it “desires a world free of nuclear weapons,” including the Korean peninsula. South Korean media praised Rouhani’s statement as an unprecedented condemnation of North Korea’s military behavior and a sign of trouble in the North Korea-Iran defense relationship, but such assessments are premature. Iran has long rejected the legitimacy of UN sanctions, and it is unlikely to abandon this position now. Tehran is also probably convinced that, despite any South Korean assertions to the contrary, it will be able to maintain its defense ties with Pyongyang while also pursuing economic engagement with Seoul. Expanded cooperation between Seoul and Tehran may usefully provide a more open channel for dialogue that would allow South Korea to voice its concerns regarding North Korea, but it is difficult to foresee economic agreements translating into realistic leverage anytime soon. As evidenced by the official narrative surrounding President Park’s broader sanctions compliance campaign, this media framing was likely welcomed by the South Korean government. Yet it may ultimately prove problematic. Interpreting Rouhani’s comments as a rhetorical win for South Korea creates a new political constraint: Park will likely feel compelled in future interactions with Iran to publicly advance the misleading impression that the nation is willing to dial back its North Korea relationship in return for improved ties with the South. However, such direct and public attempts by a US ally to influence Iran’s foreign policy could restrict channels of dialogue, rather than open them. Going forward, then, South Korea should balance its desire to pressure Tehran over its North Korea dealings against the need to promote a receptive audience in Iranian corridors. After visiting Iran, President Park announced plans later in May to visit two long-standing North Korean military clients in Africa: Ethiopia and Uganda. Unlike some North Korean military buyers, Ethiopia has frequently voiced dissatisfaction with resorting to Pyongyang for weapons-related goods and services; the country has claimed it must look to North Korea due either to cost considerations or legacy issues with certain defense technology. Washington, Addis Ababa and other capitals are believed for some time to have been quietly discussing options for incentivizing Ethiopian compliance with UN resolutions on North Korea. This behind-the-scenes approach holds greater promise of turning “reluctant” clients away from North Korea. Park’s intervention in Ethiopia was anything but quiet, and despite the promise of warmer economic relations with South Korea, Addis Ababa issued no public statements on the history or future of its defense contracts with Pyongyang. In response to President Park’s request for support in upholding UNSCR 2270, Ethiopian officials merely said: “Ethiopia will, as it has in the past, continue to support denuclearization of the Korean Peninsula.” As highlighted in a previous 38 North article, that past “support” has not included compliance with the North Korean arms embargo. More promisingly, South Korea and Ethiopia signed a limited defense agreement that may enable Seoul to help provide some of the defense equipment and services that Pyongyang has traditionally supplied. If Seoul pursues such cooperation, it must provide attractive financing. As with Iran, South Korea should carefully manage the public relations around its relationship with Ethiopia. In particular, it should avoid undermining the “reluctance” of North Korean clients such as Ethiopia, adopting a low profile where appropriate to address likely Ethiopian concerns about political fallout from shifting defense ties under pressure. Uganda, Park’s next stop, has traditionally not shown Ethiopia’s level of reluctance to deal with North Korea. Instead, it has exhibited the qualities of North Korea’s most resilient customers: a long history of political and military cooperation, and a purported desire to maintain it; appreciation of North Korea’s dependability as a supplier; strong personal relationships between senior officials; and a desire to demonstrate independence from the influence of others, especially Western capitals. In a signal that Uganda had probably put little concerted thought into this series of policy pronouncements, the Ugandan Ministry of Foreign Affairs then issued a statement clarifying that it had only agreed to comply with UNSCR 2276—the wrong resolution. UNSCR 2276 renewed the mandate of the Panel of Experts on North Korea. It was UNSCR 2270 that imposed the sanctions in question. Solidifying the confusion, Museveni stepped into the fray and publicly affirmed that “the directive takes immediate effect and is aimed at ensuring that Uganda complies with the UN resolution on North Korea” Precisely what that directive says was never published. Museveni also signed a host of economic agreements and a defense pact with South Korea, which would “expand cooperation in the area of military technology and training” and help to “fill the void created by the disengagement of defense and police cooperation with North Korea,” according to a Ugandan Foreign Ministry spokesman. The debacle is a useful episode both for understanding the Uganda-North Korea relationship and for anticipating Uganda’s behavior in the coming months. Though Kampala’s messaging changed frequently during Park’s visit, two themes remained constant: Uganda has no intention of being pressured out of its wider North Korea relationship, and it will only sever the contracts that it is firmly and clearly obliged to end under UNSCR 2270. These positions suggest that Uganda sees a deeper value in its ties to North Korea, with likely emphasis on maintaining some relationship with the DPRK’s armed forces and its Ministry of People’s Security. It therefore appears likely that Uganda will do the bare minimum to be able to claim to South Korean partners that it is complying with UNSCR 2270. One could foresee, for example, Uganda explaining that it has decided, with immediate effect, not to renew or conclude any new security training contracts with North Korea. Recent South Korean media reports citing a Ugandan military official as saying that Kampala plans to expel North Korean security forces swiftly gives some hope that this will not be the case. However, Kampala may also purchase more non-lethal weapons from the North Korean contacts it has cultivated over decades, and continue to argue that they are not a breach of the resolution. It may seek to replicate Namibia’s brand of collaboration with the DPRK, depending on the outcome of a UN review of Namibia’s defense facility construction contracts with the country. In such cases, Uganda could continue to find ways to limit damage to its security relationship with North Korea and inject funds into North Korean military coffers. Whatever Uganda’s level of compliance proves to be in practice, there will be little doubt that South Korea bought it. Kampala appears to be willing to rent out parts of its relationship with North Korea for a profit, but it is unlikely to put any permanent severance of ties up for sale. Its adherence to UNSCR 2270 must therefore remain subject to detailed scrutiny and active diplomatic outreach. Seoul’s next attempt at outreach took place in Cuba, a country with which it has no established diplomatic relations and therefore a limited ability to offer the type of inducements it did for Iran, Ethiopia and Uganda. Little progress on North Korea was evident from the South Korean Foreign Minister’s interaction with his Cuban counterpart on June 5. Cuba, like Uganda, is historically one of North Korea’s most steadfast partners; Havana has firmly resisted international pressure to sever its dealings with North Korea, and it remains broadly resistant to sanctions enforcement efforts, even after it was caught shipping military goods to Pyongyang in 2013. Cuban leaders appear to have easily swatted away Seoul’s completely transparent attempt at pressuring them to support UNSCR 2270. Why did Seoul’s campaign generate concrete policy shifts in Uganda while it failed to do so in Cuba? In part, the absence of established diplomatic relations between Seoul and Havana provided South Korea with little foundation for competing with the DPRK for Cuba’s trust and interests. Even with the most concerted of efforts, an active diplomatic or economic relationship between the two would take many years to bear fruit. In the meantime, it will be easy for Cuba to play a balancing act. Indeed, it is the only country in the above-mentioned group to have recently hosted high-level delegations from both Koreas. That may soon change, however. In light of the level of South Korean diplomatic activity on UNSCR 2270, Pyongyang may feel it needs to safeguard its trade relationships through regular, high-level, in-person interaction with a much wider range of countries. South Korea’s effort to tighten sanctions enforcement following the adoption of UNSCR 2270 offers several lessons for future outreach. Iran demonstrated that accepting half-hearted public pledges at face value may constrain future bilateral dealings. “Reluctant” North Korean partners, such as Ethiopia, may be gradually swayed through tailored outreach strategies that focus on behind-the-scenes engagement. Uganda’s pledge to foreswear sanctions-relevant contracts with North Korea undoubtedly marked Park’s greatest success, but Kampala’s mixed messages underscore the limitations of any South Korean strategy to “buy compliance.” And Cuba serves as a warning that Seoul may face more active efforts by Pyongyang to retain its military trade partners going forward. Park will next head to Moscow—a major safe haven for North Korean illicit networks and facilitators—and other trips to countries of interest will surely follow suit. Her activities there will offer yet another opportunity to examine the health of the relationships on which North Korea depends for its illicit pursuits. Jack Kim, “South Korea courts isolated North’s old friends in push for change,” Reuters, June 7, 2016, accessed June 17, 2016, http://www.reuters.com/article/us-northkorea-southkorea-diplomacy-idUSKCN0YT0PU. The DPRK dispatched Kim Yong Nam, President of the Supreme People’s Assembly Presidium, to meet with leaders of eight African nations: Burundi, the Central African Republic, Chad, Equatorial Guinea, Gabon, Mali and the Republic of Congo. It also sent delegations to Laos, Vietnam and Cuba for talks. In January, the US Treasury designated an Iranian entity for helping North Korea produce a new rocket booster, for example. See “Treasury Sanctions Those Involved in Ballistic Missile Procurement for Iran,” US Department of the Treasury, January 17, 2016, accessed June 17, 2016, https://www.treasury.gov/press-center/press-releases/Pages/jl0322.aspx. Andrea Berger, “Target Markets: North Korea’s Military Customers in the Sanctions Era,” Royal United Services Institute, December 8, 2015, accessed June 17, 2016, https://rusi.org/publication/whitehall-papers/target-markets-north-korea%E2%80%99s-military-customers-sanctions-era-whp-84. Andrea Berger, “Is Ethiopia Violating UN Sanctions against North Korea?” 38 North, December 23, 2014, accessed June 17, 2016, https://www.38north.org/2014/12/aberger122314/. It is possible that the arms they are referring to are non-lethal, such as tear gas guns, which North Korean officials have been seen holding in Uganda. It is unclear whether the UN sanctions regime covers such weapons. See Alastair Gale, “South Korea Targets North’s Military Links in Africa,” Wall Street Journal, May 25, 2016, accessed June 17, 2016, http://www.wsj.com/articles/south-korea-targets-norths-military-links-in-africa-1464157345. Kampala may have initially offered limited cooperation only to see what price it could extract from Seoul, possibly helping to explain the public relations fiasco that ensued. “Kim Yong Chol Visits Cuba,” NK Leadership Watch, May 26, 2016, accessed June 17, 2016, https://nkleadershipwatch.wordpress.com/2016/05/26/kim-yong-chol-visits-cuba/.